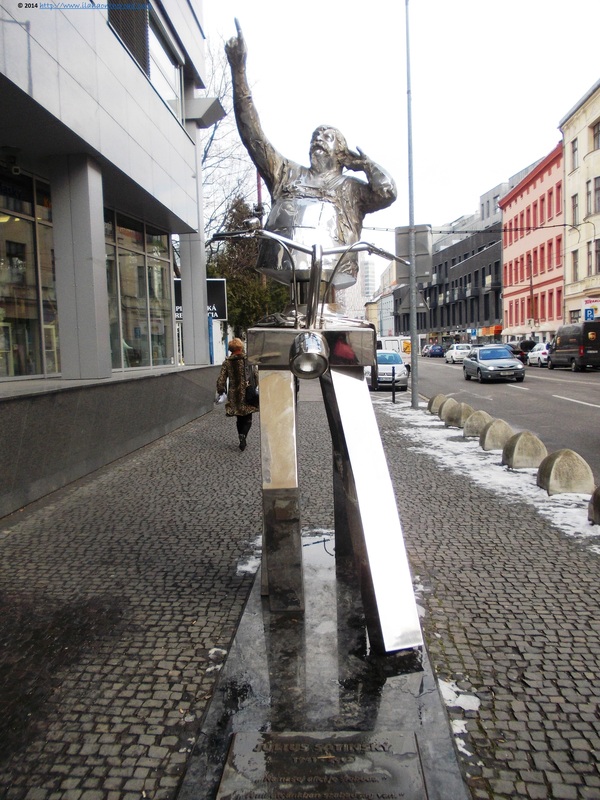 I wanted to visit Bratislava for many years, but was always sure that will there via Vienna. The plan stand till a couple of weeks before the trip, when we decided that I miss Prague more than Vienna so I better spend more hours on the road, but I have more chances to revisit Prague, a city I haven't seen for 10 years. Thus, I booked a bus ticket with the Student Agency, for a 4-hour journey, that ended up as one of the most long pleasant bus trips I had in the last year. The buses are not only cheap, but also clean and with comfy chairs, plus free coffee served by an overall excellent service, and last but not least, with an impressive selection of movies that I hungrily watched. From the Czech Republic to Slovakia I had enough time to notice the change of landscape and the highest frequency of factories and heavy industry in general. 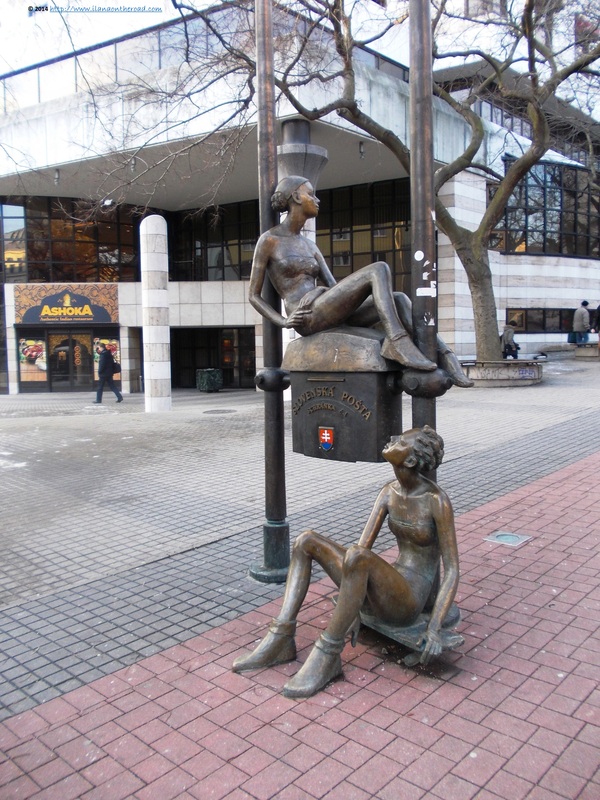 Once arrived in Bratislava, the landscape around the central bus station was at least deceiving, but once we were heading to the central historical area, everything started to look much better, with creative statues and street art that fought successfully against the post-communist monotony. The biggest mistake when someone arrives to Bratislava via Prague - probably Vienna is encouraging a similar behavior - is to start making comparisons. Although both cities keep a strong Austro-Hungarian influence, they have individual personalities and should be taken as such. 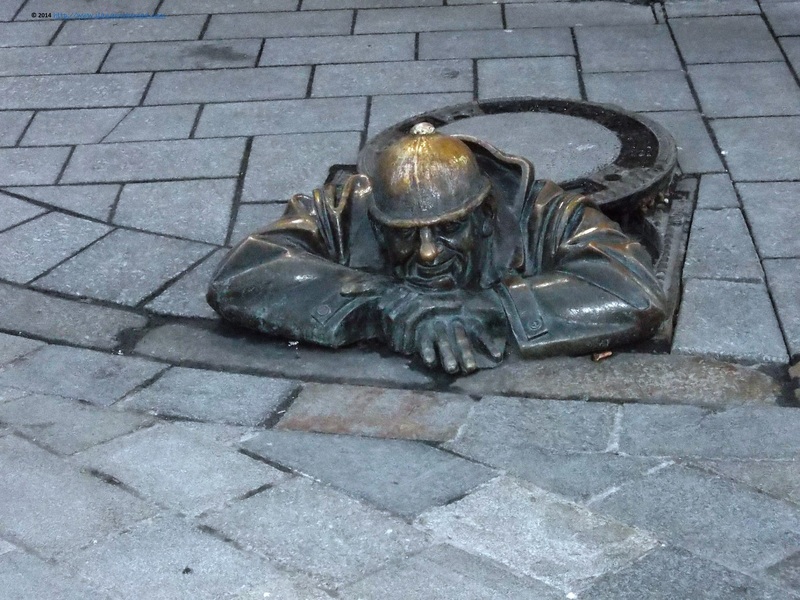 Once I stopped thinking in those terms, the beauty of Bratislava revealed its secrets. 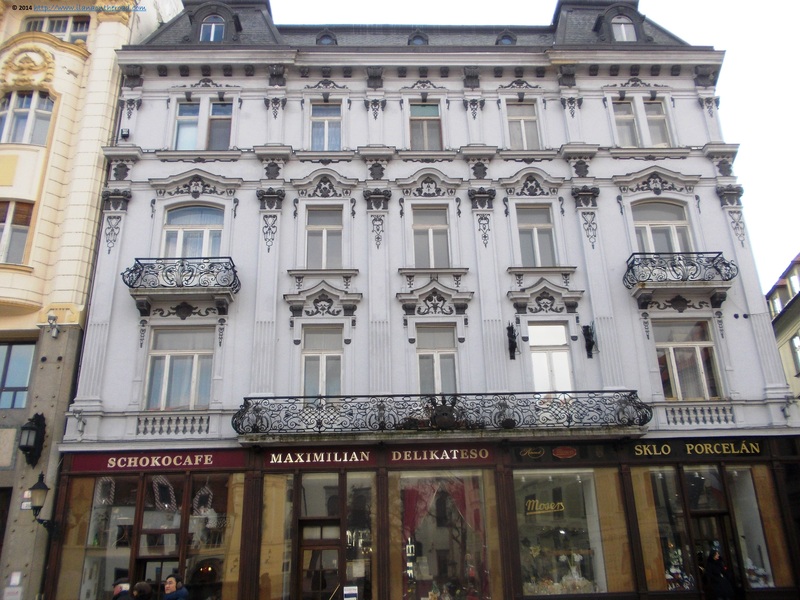 We followed Dunajska ulica and after Laurinska, with many elegant shops lost in-between old looking buildings. As we visited the city on a Monday, both the Galeria Nedbalka and the Museum of the city history were closed unfortunately. We followed our first encounter with the city going around the historical center, with a stop at the Information point to request some details about how we can reach different objectives on our agenda. 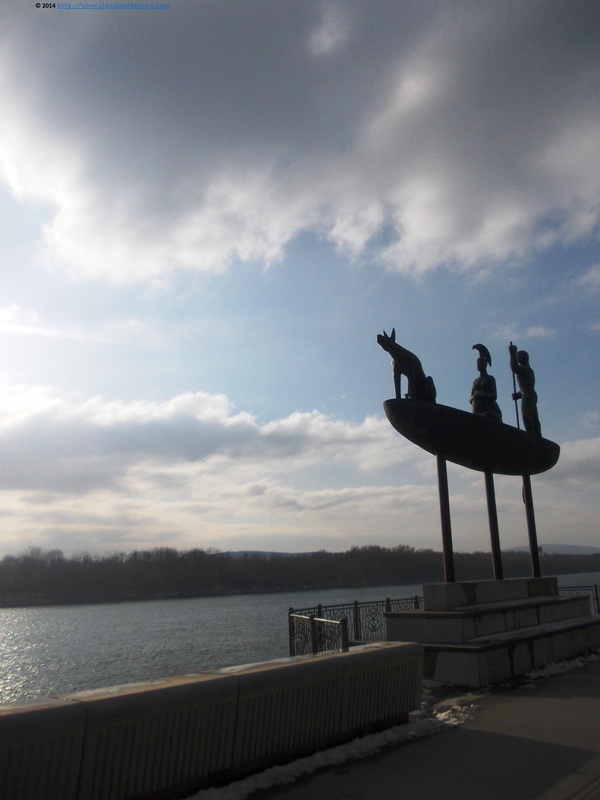 On the other side of the history, the Danube was shining in the light of the winter sun. The last time I had an encountered with the river was more than 6 years ago, in Bulgaria, at Ruse. Was happy to meet again, but we went fast-forward, near the elegant hotels of the River Park area. As I am easily getting lost and always looking for directions, it's only a question of time when I will find out how welcoming are its inhabitants. Bratislava passed easily the test more than once. Due to the smart directions we were given in English, we succeeded to arrive at the memorial of the prodigious Jewish scholar Chasam Sofer. 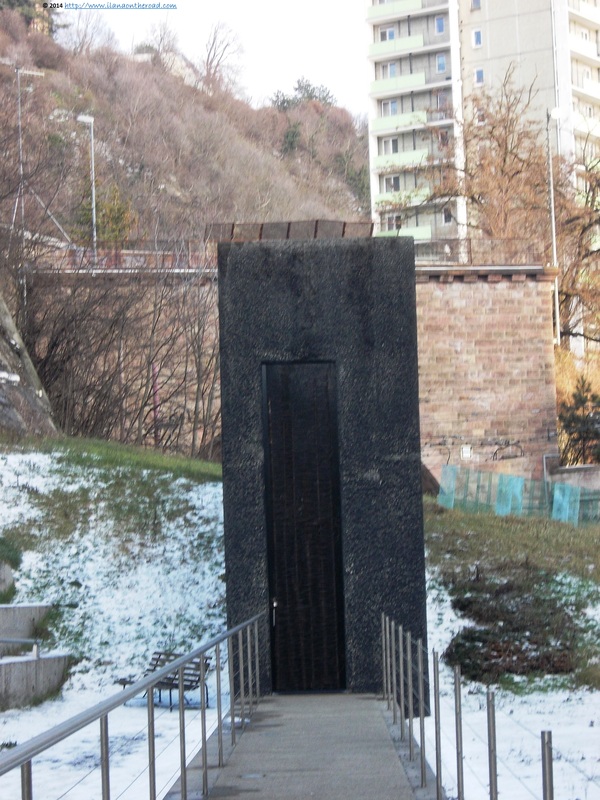 It is situated where once used to be a Jewish cemetery and can be visited only upon request. From there, we decided to return in the city with the tram. We found tickets - ridiculously cheap - at an old looking machine in the station. The trams, as some of the buses, probably didn't change in the last decade, but we arrived safe and in due time. We returned in the historical area where we spent more time visiting shops of traditional art and porcelain and helped other tourists to have pictures near the famous Napoleonic soldier, one of the main visual highlights of the area. Around lunchtime, the streets were quiet, and we needed some food energy to continue our walk and to be fresh enough for another 4 hours of bus trip back to Prague. 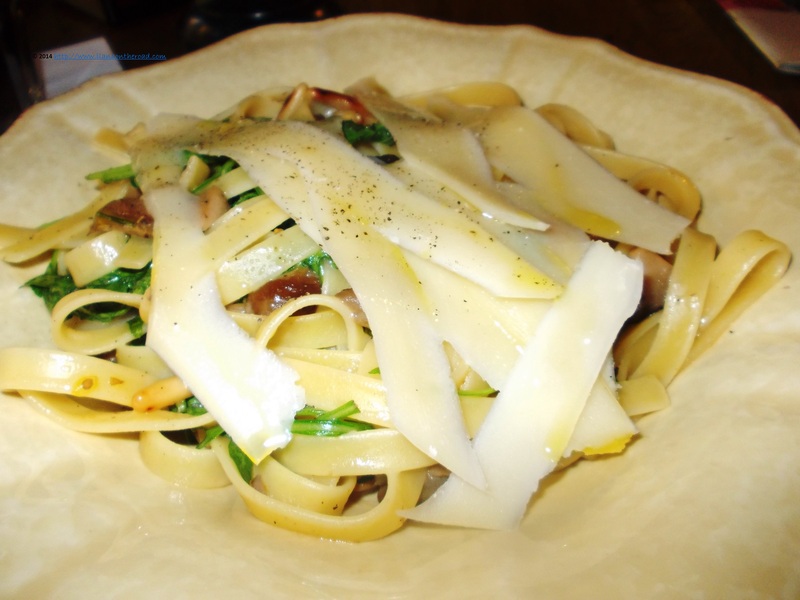 Out of many available options, we decided to have some fettuccine at Prini restaurant. We were the only customers and the service was very good, except for the people who were smoking inside. Even though Slovakia is using Euro for a couple of years already, the prices, at least for food and transportation, are ridiculously cheap. After lunch, we walked in a different area, encountering at every corner spectacular groups of statues, especially around Postava area. We had a stop at an Oxford Books store, made some pictures of the Grassalkovitch Palace, the residence of the president, very busy at the beginning of the week, and tried to imagine the stories of the old houses from Palisady street. Once we returned once again in the historical center, the streets were full of life, as many people were on their way back from work, and did one more stop before going home for a coffee or maybe looking for a nice present. 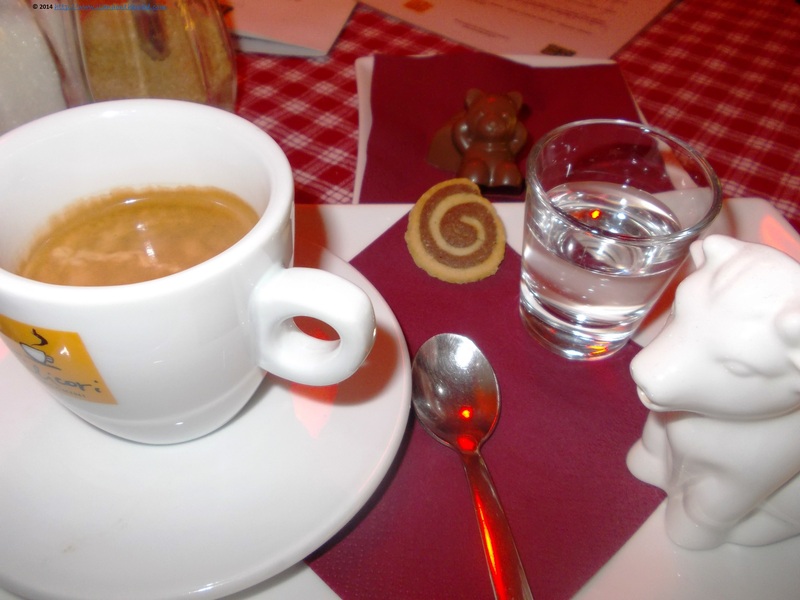 As for us, due to the cold winter weather, we needed to have a last visit indoors, this time for a coffee and maybe a little piece of chocolate, at Bon bon. The ambiance was so welcoming and the chocolate so tempting that we were about to forget that it is time to return to our bus. 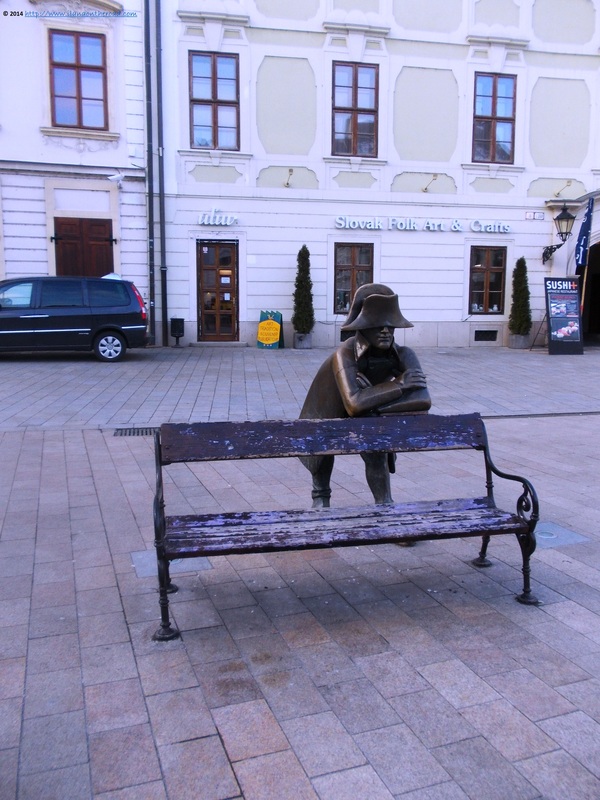 If I will have the chance to return to Slovakia soon, would love to have one more stop to Bratislava, before trying some interesting hiking in the Tatra mountains. That first encounter was a good start, for sure.